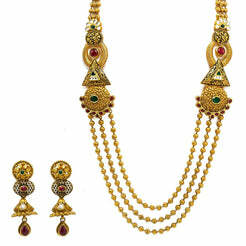 22K Yellow Gold Temple Necklace & Earrings Set W/ Rubies & Multi Strand Beaded Pendant Necklace for women. 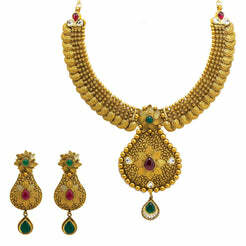 Dare to stand out with this stunning 22K yellow gold Temple necklace and earrings set, embellished with precious rubies. Its design features a multi strand beaded necklace and large textured eyelet pendants with centered rubies and a lining of round accents. 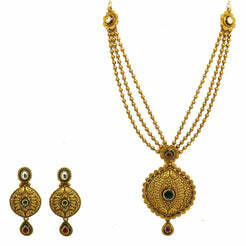 The necklace is 19 inches long with a width range of 2-15 mm. The pendant is 68 mm long and 58.5 mm wide. Each drop earring is 45 mm long and 37 mm wide. 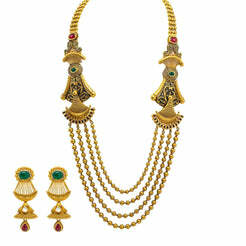 This unique Temple set has a total gold weight of 72.1 grams.